This week’s Weekly Leader Blog of the Week is the popular Leading Blog, a must read for every student of leadership. While it covers a wide range of topics, it does an especially good and timely job of reviewing the latest leadership books. At LeadershipNow, we want to change the way you think about leadership. It is not about position. Leadership is everybody’s business. It is for men, women and children. It is for families, business and communities. It is for you. In today’s world we need leadership now. We need people of all ages from all backgrounds to take advantage of the myriad of opportunities that exist to make a difference. The path to leadership begins in the mind. Leaders think differently. They see the world differently. We all possess the capacity for leadership, but only those who cultivate it will ever become truly effective leaders. By providing articles, features, books, multimedia and other resources, we would like to encourage you to develop the leader in you — to become an active participant in shaping your future and the future of others. 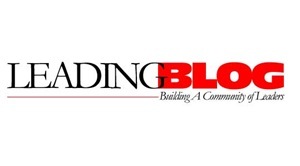 So, if you want to stay updated on the latest leadership books and other resources, make sure you subscribe to the Leading Blog today!